Last year, I started to work on an idea to do all of my Christmas decorating with a touch of Harry Potter. Hence, the name I came up with was A Wizarding Christmas. First, I knew right off that I wanted the style to be elegant. Second, the colors had to be traditional Christmas colors. This Christmas Harry Potter Wreath is one part of my Harry Potter decorations. Below is each step to create this wreath. 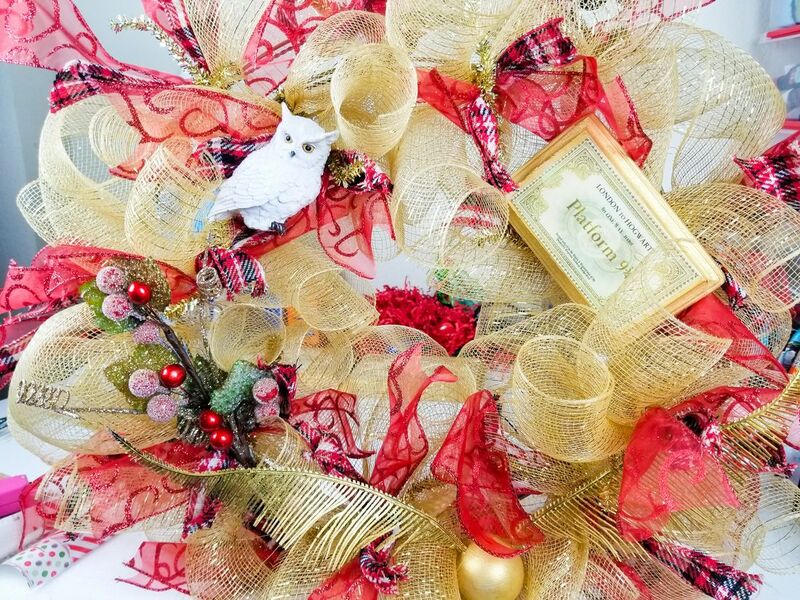 While I don’t have a video I will like you to one I used to create the bases of this wreath. 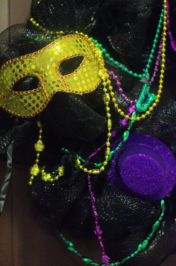 Additionally, there is few extra rolls of mesh that were tied together with pipe cleaner to add more texture. The video is located here. 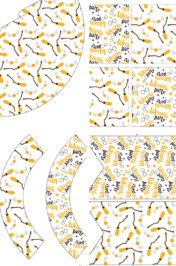 First, is to create the Hogwarts ticket which you can find many printables online for. Measure the wood then set the size to print to the size of the wood. Paint the wood with gold acrylic paint. Second, use mod podge to place the ticket to the wood then cover the top with mod podge to seal. Additionally, you may use a water proof sealant once the ticket dries if you plan to hang the wreath outside where rain is possible. 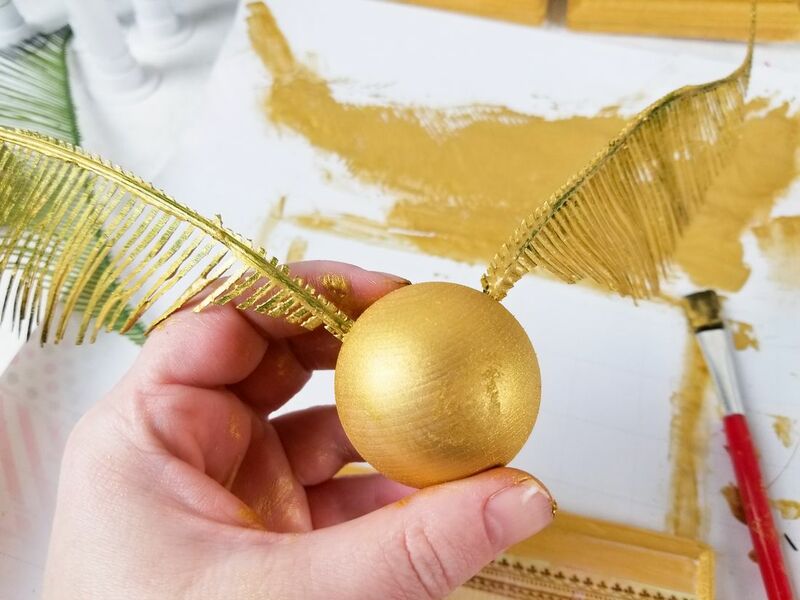 Next, for the golden snitch find wood craft balls at Michael’s or Hobby Lobby. Drill a hole into each side of the wooden ball. 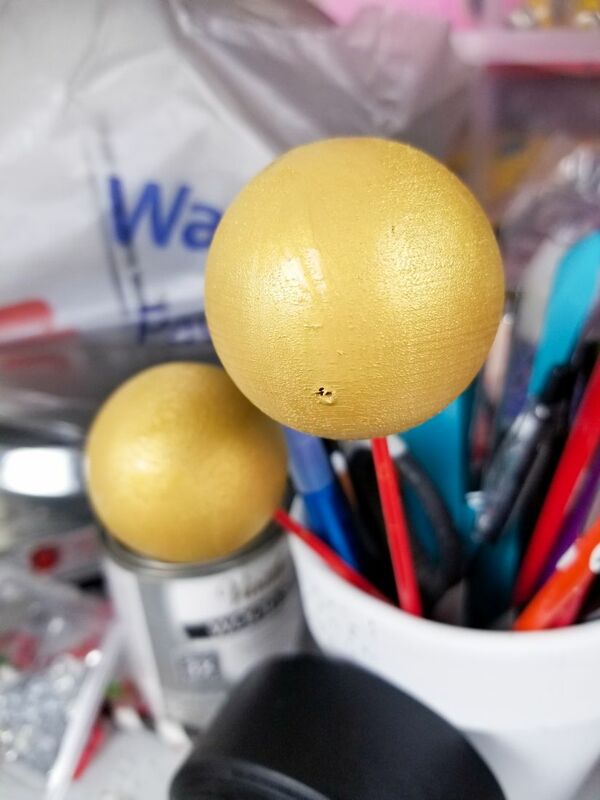 After the holes are drilled paint the wooden ball gold with the same acrylic paint that was used for the Hogwarts ticket. Hence, to get all sides place the ball on a paint brush then paint well. Furthermore, use two pieces of floral and cut to the look of the snitches wings. Paint the floral gold with several coats of paint; drying in between. Certainly let all of the items dry meanwhile dressing the wreath with mesh. Once the mesh is added to the wreath tie on some ribbon for additional decor. Lastly, hot glue the hogwarts ticket and golden snitch into place. As you see here a white owl has been added. Hence, this owl can be found at Hobby Lobby. The owls do tend to sell out quick which is why there is only one. The wreath you see above is on the front door. Additionally, I made two others for the balcony for our Wizarding Christmas theme. Join us for more wizarding Christmas projects this season. Your wreath is gorgeous and I love all the colors! 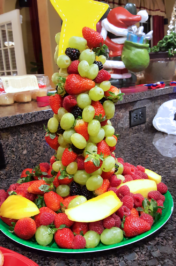 Very creative!!! Now you have me wanting to make a Harry Potter Wreath! Oh my! I think this is the best Christmas decoration that I’ve seen all year! I’m actually re-reading the first book again right now! That is the best wreath I’ve ever seen! I’m a huge Harry Potter fan, so I can’t wait to make it. You even included the Snitch! This is cute! I like how you put the materials altogether the snitch is what makes it even more attractive. How creative this is. 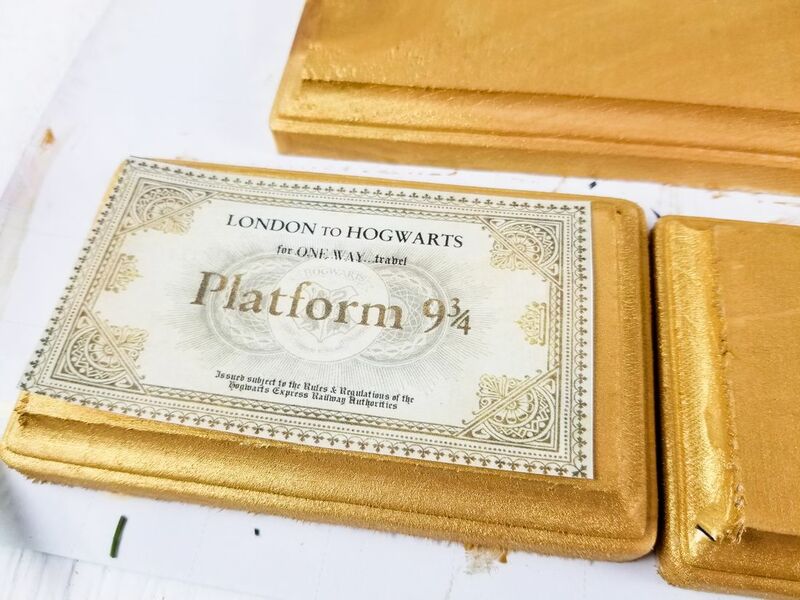 A few friends of mine and I love Harry Potter, so this looks like it would be a really fun craft for us to do together! I’ll have to share this post with them and see what they think. We started making our own wreaths when my children were small. 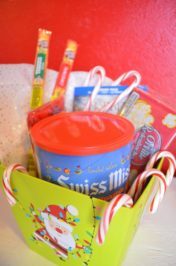 We would go to the store and pick items that fit each child’s personality. They each made their own wreath to represent themselves and the holiday. This is so original! I love Harry Potter theme anything and this will be a lovely and easy DIY wreath for us! 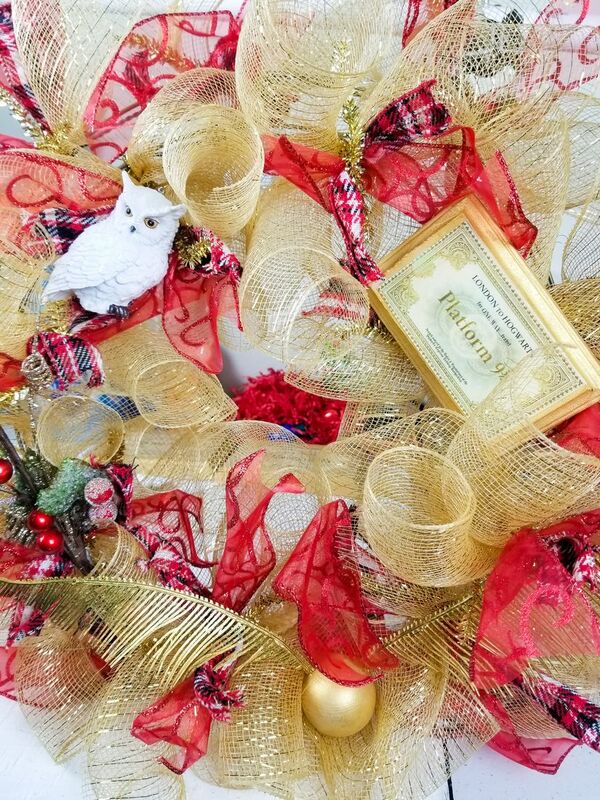 As a huge fan of Harry Potter I am literally Fangirling over this wreath! Loving it! Omg how cute is this wreath?!? Perfect for a Harry Potter fan! What a fun wreath! I know a few Harry Potter fans who would love this.